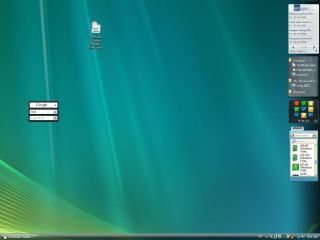 When used properly the Sidebar Gadgets offered by Windows Vista let you collect all the information you need on your desktop. Here's our roundup of the pick of the bunch. Don't waste time waiting on the platform - check your journey using the National Rail gadget. It tells you the status of all trains at any station in the country, and is accurate up to the minute. The eBay Auction Watcher keeps track of all your items, so you can spend less time searching eBay and more time on tasks you should be doing instead. SwiftRun lets you search websites and run applications with a few swift keystrokes, and eliminates laborious navigation. It also does the job of multiple gadgets, so you only have to download one search gadget to cover Wikipedia, IMDb and more. Head straight to Wikipedia, do not pass go and do not collect £200. Having the ability to search Wikipedia quickly without even opening your browser is the fast way to omniscience. 5. "Upload to Facebook by drag and drop"
Bypass the laborious Facebook photo-uploading process and use this gadget instead. Just sync it with your account, drag on a folder of photos and let it upload in the background. When you have time you can reorganise the names in your account later. Shopping needn't take time in the digital age, and this gadget makes it even easier. You can search Amazon.co.uk and buy quickly, though this may be dangerous when coupled with alcohol. This one is built into Vista so you don't even need to go searching - a time saver in itself. Just subscribe to RSS feeds in IE and then load them into the gadget to stay up to date with your favourite sites without taking the time to browse. One of the most successful news gadgets to date, ITN has embedded videos as well as headlines. Staying informed has never been so easy. Don't let Twitter slow you down. Get all of your friend's status info on your desktop with Twadget. Stay in touch with the best technology site on the internet, and all the latest news and reviews. Need we say more? Drag and drop your files to this printing gadget and they print automatically, so you don't even have to open your documents before that meeting. The art of blogging is immediacy, and it doesn't get any faster than this. Upload to your Blogger account straight from your Sidebar, whenever the muse hits you. Outlook 2007 is a great program, but it could be more convenient than this. Have your emails in plain view, so reading them has never been quicker. This is possibly the entire web in one gadget. Mini Explorer lets you browse all your favourite websites such as Facebook, Google, Dig, YouTube and even torrents from one place. Keep track of your recent documents and launch them in seconds from the Sidebar. The recent items gadget is a must have for multi-taskers everywhere. The System Control gadget does exactly what it says on the tin. Stay in control of every facet of your PC by accessing the command prompt and system processes from your Sidebar. If you always have one hand on the Ctrl-V shortcut then this gadget will save you hours of needless re-copying. The clipboard saves your clipboard entries so you can re-use them later. The only question you will have after installing this is how you survived without it. An essential gadget for Gmail users everywhere! Being able to get your mail to your desktop without logging in is a real time saver. One for US readers, check your route home this evening with the Live Maps traffic gadget which now supports tonnes of US and Canadian cities. If you're way home is blocked, stay at work and come in late tomorrow! Disconnecting that USB drive can be a bit fiddly in Windows Vista, but this gadget gives you a Mac-style quick disconnect, so you don't have to risk your data to save 30 seconds. How many ounces in a kilo? How many pounds in a tonne? What's a stone? Conversions can be a nightmare, but use the N converter to make them easy and, more importantly, quicker. Staying informed about your football team can be a time consuming process. Most of the top English Premiership teams have gadgets now, and none are finer than this marvellous Chelsea one. If that's what Russian millions can do, wait till you see Man City's!